Weddings are not cheap these days. Malaysian weddings – especially Chinese weddings – can rack up costly amounts, depending on the demands from the bride and groom’s families. If you’re in the process of wedding planning and wondering how much you should set aside for your big day, we’ve done our research and curated the average numbers right here. Ready? Brides typically wear a minimum of 2 dresses and 2 shoes on their big day. The average price for one gown is RM2,000, RM400 for a pair of bridal shoes, RM400 for the groom’s shoes and RM1,800 for his tux. Expect to pay a minimum of RM1,000 for a full-day bridal makeup (bride only). For quotes from professional makeup artists near you, tap the button below to get started! Wedding decorations at the venue can easily go up to RM3,500 especially if you want fresh flowers. Prepare to shell out RM2,000 for flower bouquets for the bride and bridesmaids and an additional RM2,000 if you want to hire a photobooth. Wedding cards can start from RM0.70 per card to RM5 or more, depending on the design. If you’re sending out invitations to 400 guests, you’ll be paying approximately RM1,200. Don’t forget about the ang pao that the groom will be giving the bridesmaids at the bride’s house – which usually racks up RM1,500! You would also need to consider the door gifts at the end of the wedding dinner, which could amount to RM400 or more. If you’re hiring professional photographers and videographers for the whole day and require same-day edits for the dinner slideshow, expect to pay more than RM10,000 for both services. On the plus side, you’ll be guaranteed great shots to freeze your precious moments into lifelong memories. The church or ROM venue rental typically costs RM2,000 for a few hours. RM5,000 for a wedding planner might sound a lot, but it’s a reasonable amount to pay for having a smooth, stress-free wedding! Chinese weddings are well-known for their 8-course meals, and Chinese restaurants typically cost about RM60,000 for 40 tables (10 people per table). Hotel dinners, on the other hand, are a lot more costly and could even go up to RM120,000! 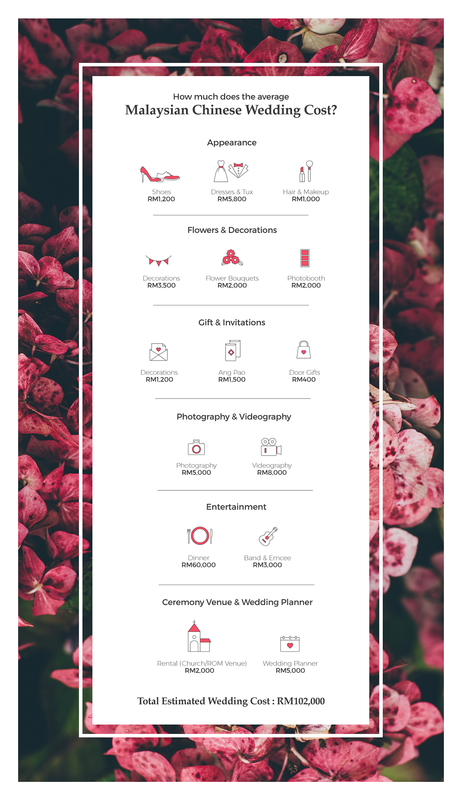 Disclaimer: This infographic does not include the cost of other services, such as floral decortions on the cars, hair and makeup services for the bridesmaids, fees for religious figures, wedding rings and others. What’s a good ang pao amount to give at Chinese wedding dinners? We understand the dilemma of deciding how much to give at Chinese wedding dinners. The amount would be totally up to you, and you shouldn’t feel bad if you can’t afford to give a hefty amount. After all, you’re there to celebrate the matrimony of your friends or family, and that alone speaks volumes of your support. However, Chinese wedding dinners can be really costly. So if you’d like to contribute a generous ang pao to help the newlyweds out, they’d greatly appreciate it. We talked to couples who had their dinners at restaurants and hotels, and they all agreed that a nice minimum amount to receive would be RM150-200 per guest for restaurant dinners, and RM250 or so for hotel dinners. Nevertheless, you shouldn’t feel obligated to fork out so much money if you’re undergoing financial constraints. This guide is just to help you understand the cost breakdown of Chinese wedding dinners in Malaysia. For more information on wedding services, visit our site. If you want more ideas on the best places for pre-wedding photography in Malaysia, bridal makeup tips and more information that could benefit your wedding day, check out our comprehensive guide here. Happy planning!